We had seen Avenue Josep Tarradelles from a hotel bedroom and were amazed at the amount of trees in a city street and decided to go and have a look. There is a double row of trees in the middle of the street and a row down each side. We walked up one side and down the other and came across this cafeteria advertising lunch for €9.50. We were hungry and decided to give it a try without high hopes. Turned out to be really good! 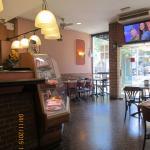 It was quiet when we went in being only 2 pm and a little early for most Spaniards to be eating. There was a choice of starters, mains and desserts. We had autumn salad which was the freshest leaves served with sweet corn, pomegranate with a creamy dressing and sea food with noodles. Both very tasty. Then salmon with salad. The waitress asked if I'd prefer grilled vegetables as I'd already had salad. I said yes please and it came with grilled aubergine, courgettes and a baked potato. The other main was entrecôte steak (for €3 extra) served with the same grilled veg and a few excellent fries. The salmon was cooked to perfection with crispy skin. The entrecôte came cooked as requested and was tender, moist and tasty. Next profiteroles and caramel custard. We had a nice bottle of rosé wine with it. The girl who served us was very pleasant, helpful and polite. She had a little English. A surprisingly good meal and good value. We would definitely go back ! We think that they must change the menu every day as it was type written and headed Wednesday. 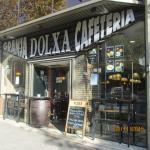 Been to Granja Cafeteria Dolxa? Share your experiences!